Now you can protect the finish and value of your larger Millermatic® MIG welder or Syncrowave 210 TIG welder. EZ-Change Dual Cylinder Rack with Elevated Cable Rack - For Millermatic 212, 252, 350 MIG welders or Syncrowave 210 TIG welder. What style plug comes on welder. Spade in v pattern or two spade and round? Millermatic 212 MIG Welder Auto-Set 907405 would run of your Bobcat. The 212 is the biggest machine miller recommends running off a Bobcat. 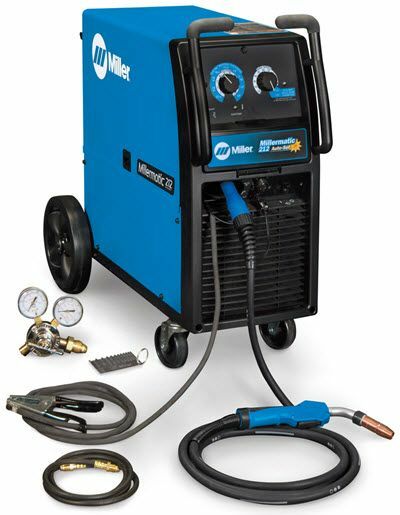 The Millermatic 212 MIG Welder Auto-Set 907405 has a 3 year warranty through Miller. The Millermatic 212 MIG Welder Auto-Set 907405 would be a good replacement for a Millermatic 35s. I believe that the 35S was only 150 amp machine . The 212 has a max output of 210 amps. What happens if something happens to the welder during transport? We suggest that when you purchase a Millermatic 212 MIG Welder Auto-Set 907405 or any product that we sell that you open the carton and inspect the product immediately.Do not allow the delivery person to leave until you have completed your inspection. if the product is damaged refuse the shipment. Then contact us immediately. Hi, I was wondering if you guys offer any form of financing or payment plans for companies? Thank you. The Auto Set feature on the Millermatic 212 MIG Welder Auto-Set 907405 is designed to work only with steel. It will not work with aluminum. I'm considering the Millermatic 212 vs the Hobart Handler 230. What are the advantages of the Miller and the Hobart? I'd like to have the flexibility to use the MM 212 remotely, while using my portable generator as the power source. The 212 power cord terminates with a NEMA 6-50 plug and my generator includes a 240v NEMA L14-30 (30amp, twist-lock) outlet. If I [have my qualified electrician] make up a pigtail to adapt from the 212's NEMA 6-50 plug to the generator's NEMA L14-30 outlet, will I be good to go? Does this have a 14pin connection that will allow me to run a RC8 feeder if I need to weld little further from the machine then normal ? if this is ordered and shipped to California is there sales tax? Miller advises that the Millermatic 212 MIG Welder Auto-Set 907405 can hold up to a 300cf or T size cylinder on the cylinder rack/cart. Will you ship to a freight forwarder? I am in the millitary and stationed on Guam which is a US territory. We can ship the Millermatic 212 MIG Welder Auto-Set 907405 to a freight forwarder as long as he is located 48 states..
Hello. I need quotation for 2 Millermatic 212 Thanks. I saw in your power accessory section that you have the following extension cords...Direct Wire Extension Cord - 230 Volt , 25' or 50' 8/3 Would these be compatible with the Millermatic 212 Mig Welder throughout its application range? Since my only source of 230 volts is my dryer outlet I would love to be able to use it and not have to pay for additional 230 outlet installation. Thanks for the info. The Millermatic 212 MIG Welder Auto-Set 907405 will work properly with the Extension Cords. The only question that needs to answered is what type of receptacle you have on your dryer.. The Extension Cords have a NEMA 6-50 p style plug if your dryer has this type of receptacle then it is a direct plug in. Millermatic 212 MIG Welder Auto-Set 907405 is brand new direct from the factory. 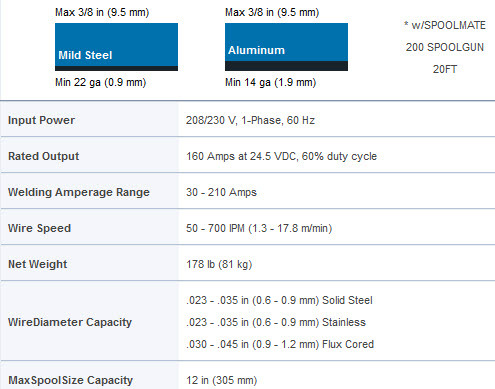 In the information sheet it says the package comes with 15-ft 250-amp M-25 MIG gun for .030/.035-in wire. Does this mean that if you want to run .023 or the .045 you have to buy a new gun, is my in-experience making me miss something? Millermatic 212 MIG Welder Auto-Set 907405 has a welding amperage from 30-210 amps. Will the 100 series gun fit and work on this welder? I know its not rated for the max output. What size breaker should I use for this machine and what size electrical wire? Based on 208 volt or 230 volt input power, you should have a dedicated 30 amp breaker for your Millermatic 212. The 212 comes with 7' of 12/3 input power cable with a NEMA 6-50P plug installed. You should refer house/shop wiring questions to your electrician. Thanks for your question. This is a great machine. I just set it up and layed a couple welds. Runs great right out of the box. I plan to review it again after i put some hours on it. I'm glad I went with Miller because there is no comparison. Go Blue!! ConsGround clamp and gas line are cheesey but they work. I review this welder for approx 8 months, using 1/8 material up to and including its rate 3/8. The lead i would like is around 18 to 20 ft. I find the stock lead a little short. Other than that it is and outstanding machine, quality built, what i expected from Miller. I was not disappointed. Controls are very easy to use a tool i look forward to when sticking some metal. Bought the 212 for the type of use I need. Also have miller tig and plasma cutter. Great machine, great price, fast delivery. I love it. We rarely deal with anything over 1/4", but I prefer to have a machine that has a greater capacity than I need. Right out of the box, it worked excellent!! Arrived in perfect shape, best price, only negative was the person delivering it. Extremely pleased. The welder works great and exceeds all my expectations! Whether I'm welding thick steel plate or installing patch panels on another classic truck project, my Miller 212 steps up to task without hesitation! Once again, Miller has met and exceeded my expectations! ProsThe ability to switch between auto-set and manual mode makes for greater versatility. The run-in setting is really nice once I had it set to my preferences. It comes set as 50% from the factory. ConsI didn't buy it sooner! Great, fast service and quick delivery. This welder is everything the description says it is and more. Can't gone wrong with this purchase. Plus CYBERWELD was excellent with shipping information and timely delivery. Great product for the price and FREE shipping! Thank you. It is absolutely everything Miller says it is. Well worth the price. Cyberweld delivered on price and on time and was very prompt with rebate paperwork. Will definitely use them again. ConsWish it had a better way of storing cables like some of the older Millermatics. This welder was easy to setup and was welding with it quickly. My miller 212 is the perfect set for a hobbiest and arrived on a pallet, set up was easy 20 min from box to welding. Great product but terrible shipping. Item exactly as described. Emailed for an eta on shipping and gave my zip code. Was told it would take about 3 days being I was in Texas and it shipped from in state. Took over two weeks due to first carrier subbing it out to another carrier. Be careful if you are in a hurry. This aside, good product, great price, and customer service that responds quickly. I burned a few miles of wire using commercial MIG machines in a farm equipment plant while in college. Having that experience, I wasn't expecting much from the little Millermatic 212. That turned out to be wrong. I found this machine to be easy to set up, and a dream to use. The commercial equipment I was familiar with were strictly manual adjustment machines so, again, I was skeptical of this Auto-Set business. That also turned out to be wrong. I was pleased to discover how well the Auto-Set feature works. Dialing in the wire dimension and base metal thickness is giving me close to perfect welds with only minor tweaking, if any.The only thing I found irritating about this machine was the Mickey Mouse method Miller provides for accommodating small wire spools. I set this machine up on Sunday and I all had was a 2 lb. spool. Unfortunately, I could not find a local source of 10 or 11 pound spools. Miller's solution is to remove most of the spool hub parts and replace them with a 2" piece of PVC. I didn't have the right diameter PVC so had to beg a piece from my neighbor, which fit the 2# spool but was a loose fit on the spindle. It worked, but reminds me of using knock-off parts on a BMW. Miller might want to consider at least providing the dimensionally correct PVC with the machine. This is admittedly a minor whine, but it just seemed cheesy to me. Oh, I should point out that CyberWeld did a great job getting the machine to me on time and in one piece. I was given this welder for my birthday 2 years ago. I have used the hell out of it, and it has performed flawlessly. ProsEasy set controls, easy set up, and the aluminum spool gun operates very well on this unit. ConsI wish all welders came with a better way to store the ground and feed cord. Great price, great unit, can not ask for much more! have had this welder for about 2 yrs. now, still feel that it was a good investment. Had a little trouble with a circuit about 3 months after i got it,but had it repaired and no trouble since. Also purchased the 140/120volt model,and it does a great job too. Used it yesterday for the first time. I am very happy with the product. Duty cycle was important to me and this machine is doing the job for me. I purchased this machine to do repairs on my construction equipment and trailers it has more than paid for its self, I don't have any formal training but it made welding easy and affordable, I built a attachment for my Bobcat and I welded for 2 hours on it highest setting and it never hit the thermal overload and got the job done. I used the attachment to demo concrete slab and had a piece 5'X7' 4" thick and looked at all welds no problems, great machine would tell any one to buy Miller. This review deals mainly with the Cyberweld buying experience, which I rate a 10 star evaluation. Everything ordered was delivered and packaged well enough to avoid damage. Cyberweld has a lot of merchandise to pick from, the price and shipping are without equal. All in all a great buying experience. I bought the miller212 with the spool gun and it arrived in 5 days dropped shipped from Cal to AZ with no damage. The assembly of the dual cylinder cart was a pita due to crappy instructions and miss identified threads on the fasteners and the heads of the fasteners being 3 different sizes. Gimme a break! Also the ground clamp (made in china) is a real cheapie, but easily replaced with a Twecko copper ground clamp bought from Cyberweld!!! But that is a Miller problem.....Not Cyberweld. Would I buy from Cyberweld again? You betcha.....as a matter of fact I look forward to it! The unit is much more robust that the last unit I owner. The operation is quieter and mobility is excellent. I am much more pleased with this welder. Pros1) Mobility - bottles and all on one carriage. 2) Ease of operation. 3) Better duty cycle. thank you cyberweld for fast shipping. i got the machine before there delivery date. the only thing now is that i bought the machine about a month ago. i did not used it as soon as it arrive. i left it on the crate for 3 weeks and the day i used it, i notice that the rear wheel did not have the locks. and the wheels kept falling off. then after 30 minutes the spool gun started squirting wire by itself before it quit welding. i turned it off and look it up on the owners manuel i did not find anything on the trouble shooting section so i called miller and they told me to take it to the service center its been a week and they havent fix/replace it. it very frustrating that i spend that kind of money on a welder that i cannot use. the miller service center said it would be another week before they would get to it. if i would of known that miller did not take care of there customers i would of gone a different route. Great Mig Welder, Takes a little while to get it dialed in. The MIG is used mostly for assembly of cranks on a volunteer project involving a 3 wheel hand cranked wheelchair for leg handicapped people. (giftofmobility.org) In addition I do general job shop projects such as make antique motorcycle parts. Since some work is delicate, I bought the smaller MIG torch for greater flexibility. I am very pleased with Miller products and always recommend them.